109-yr-old Holocaust Survivor wisdom: "Look for the Beauty in Life"
Series Info: The Landry’s True Colors Series is a clean reads young adult humor series about friendship, self-esteem, fitting in, middle school and high school, frenemies, crushes, and self-image. It’s a clean reads book so it’s suitable for ages 11 and up. Blurb: Landry Albright just wants to be one of the interesting girls at school who always have exciting things going on in their lives. She wants to stand out, but also wants to fit in, so she gives in when her two best friends, Ericka and Tori, push her into trying out for a teen reality show modeling competition with them. Landry goes in nervous, but impresses the judges enough to make it to the next round. 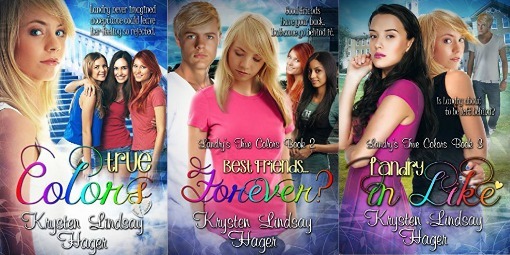 Krysten Lindsay Hager writes about friendship, self-esteem, fitting in, frenemies, the celebrity world, values, and self-image in True Colors, Best Friends…Forever? Landry in Like, Next Door to a Star and Competing with the Star. Best Friends…Forever? was ranked at #1 on Amazon’s Hot New Releases in Teen & Young Adult Values & Virtues Fiction and True Colors is an international bestseller. Her work has been featured in USA Today, The Flint Journal, the Bellbrook Times, the Grand Haven Tribune, and on the talk show Living Dayton. Competing with the Star is Out Today! Looking for a new giveaway? Then Keep Calm and Hop On! True Colors on sale for 99 cents!